The above study conducted online by Ipsos OTX Media CT, on behalf of Saatchi & Saatchi S, from May 11 - 17, 2011, has been reproduced at large and reinforces several mega-trends that are converging to profoundly disrupt the industry: Mobile Games, Social Games, Serious Games, & the Gamification of Life. Combined they present an enormous opportunity for businesses, brands and people who have welcome “the notion of weaving fun and play into the fabric of society." The study seeks to identify perspectives, attitudes and key drivers to use games as a vehicle for engagement within the employee context and more broadly across the consumer landscape. San Francisco - By some key measures, Americans are ready to accept games into some of the most important areas of their lives. In a new study by Saatchi & Saatchi S entitled Engagement Unleashed: Gamification for Business, Brands and Loyalty, 55% of Americans said they were interested in working for a company that uses gamification to increase productivity. The study, conducted on behalf of Saatchi S by Ipsos OTX MediaCT, seeks to identify perspectives, attitudes and key drivers to use games as a vehicle for engagement within the employee context and more broadly across the consumer landscape. "Leaders are beginning to understand the enormous opportunities that games hold for businesses, brands and people. Games, challenges and the notion of weaving fun and play into the fabric of society is tantamount to a renaissance," said Judah Schiller, CEO and co-founder of Saatchi S. "Well-designed games have the potential to create dynamic, rich and deeply enjoyable experiences that can foster innovation, reinforce positive behavior and increase engagement." According to study data, about half of online Americans are already playing social games during a typical day. Of those employed, 28% of respondents are playing games more than 30 minutes a day while at work. When asked how they would like to hear about a new product, 44% of respondents preferred email communications and 37% would choose some kind of online game experience. Only 3% wanted to be told about new products by TV or radio advertising. Seventy-five percent of smartphone owners are interested in playing a clues-based challenge, and 85% would be interested in playing for at least 30 minutes for the chance of winning a $100 cash prize. - When it comes to specific kinds of social challenges, respondents were most interested in participating in multiplayer gaming and trivia challenges. While not as many people are familiar with scavenger hunts and guessing/probability scenarios, they did express interest in participating in these kinds of challenges. - 27% of those interested in social challenges said they would be very likely to opt in to a social challenge sponsored by a large corporate brand; 64% very likely if it were initiated by friends or family. - ‘Discounts' are the most compelling incentives for winning a social challenge, followed by ‘Social Action' and ‘Points Towards Loyalty Program'. Only 1-in-4 of those interested in social challenges said that ‘Status in the Community' was a very compelling incentive. - Among those interested in social challenges, males and tablet owners are most likely to view these challenges as ways to connect with the local community and make new friends. - Heavy social gamers are more likely to be interested in clues-based challenges and are more aware of recent in-game ad campaigns from specific brands. - Green Giant scored high in positive sentiment following a Farmville campaign where players could earn cash to buy Green Giant products. 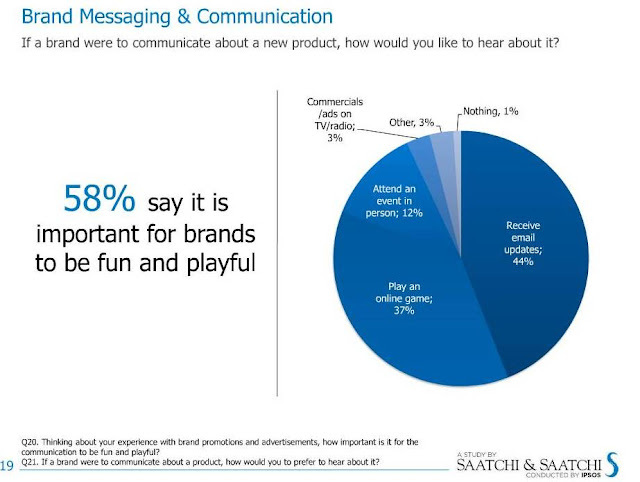 - 58% said it is important for brands to be fun and playful. - Younger Americans (18-24 year olds) were the group most willing to take a salary reduction to work for a socially responsible company. 1) Methodology: This study was conducted online within the United States by Ipsos OTX Media CT on behalf of Saatchi & Saatchi S from May 11 - 17, 2011 among 2,004 adults, ages 18 to 44 of whom 50% were male and 50% were female. This online study is not based on a probability sample and therefore no estimate of theoretical sampling error can be calculated. For full survey results and complete methodology, please contact individuals listed below. 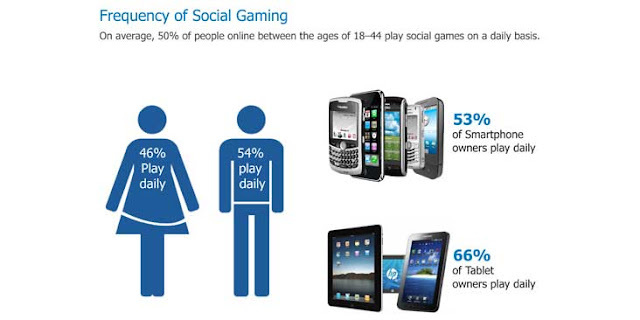 - Social Games are defined as online games that you can play on social networks or apps. - Social challenges are defined as game-based challenges that you can play on your smart device while in a public space. - Heavy social gamers are defined as those that spend 10+ hours playing social games in a typical week. Founded in 2008, Saatchi & Saatchi S are leaders in architecting social and brand movements for "good." Led by CEO and Co-Founder, Judah Schiller, the agency collaborates with some of the world's largest corporations and most revered brands to develop and execute on powerful, big ideas that in­spire and engage people while solving a wide variety of corporate, brand, and reputational challenges. Saatchi S clients are among the most influential in the world and include AT&T, Frito-Lay, Johnson & Johnson, McDonalds, NBCUniversal, and Wal-Mart. Fast Company ranked Saatchi S among the ten "Most Innovative Companies in Advertising and Marketing," and won an Effie Award for its groundbreaking, culture change initiative with the world's largest company. Saatchi S is part of the Saatchi & Saatchi network and owned by Publicis Groupe S.A., the world's 3rd largest communications group.